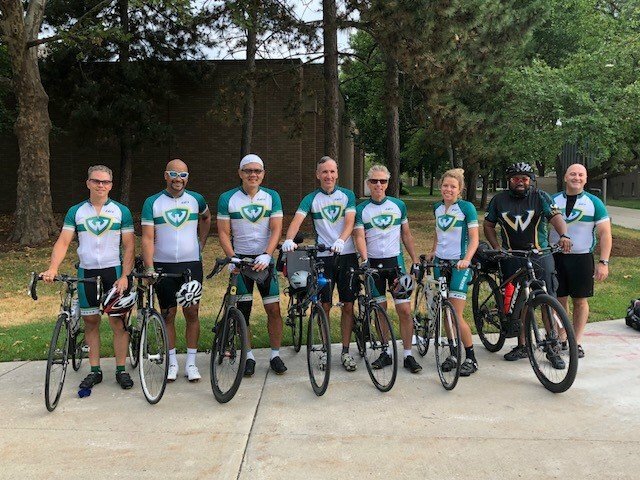 Wayne State University president — and AAMC board chair — cycles 515 miles and visits four Michigan cities to talk about the value of a higher education. University presidents don’t often visit four communities in one week. They almost certainly don’t roll into town — quite literally — by bicycle. But that’s exactly what M. Roy Wilson, MD, chair of the AAMC Board of Directors and president of Wayne State University, did during a five-day listening tour of his state this summer. Between July 23 and 27, Wilson and several colleagues — dubbed the Road Warriors — traveled to the far corners of Michigan to talk about the value of higher education and to listen to residents’ concerns about whether a college degree is worth the investment. "People are looking for value. It’s not a complaint about high tuition as much as a struggle to figure out what’s best for their kids." In each city, Wilson also hosted a town hall meeting at a local brew pub, and he invited the entire community to come out for free pizza and beer — and good conversation. One common theme among residents was whether an investment in higher education would lead to better jobs than they might find in their home towns as electricians, plumbers, and construction workers. Wilson assured them that a degree could open doors they might not even know existed. And that resources to pay for college were available for interested, talented students. Indeed, two years after taking the helm at Wayne State, Wilson launched the Wayne Med-Direct program, which guarantees 10 talented high school students from socio-economically disadvantaged backgrounds admission to both Wayne State University and Wayne State University School of Medicine each year.